As you all know I recently had my third baby, who is now almost three months old. And while I was pregnant I suffered some problems with my blood pressure and had to have regular growth scans. Thankfully I received amazing care at Newcastle RVI hospital and had customised GAP ( Perinatal institutes growth assessment protocol) growth charts in my file to accurately measure my baby's growth throughout pregnancy. This showed some problems with my baby's growth and development Ind i ended up being induced before my due date. I am now a very proud mummy to a healthy little boy. The GAP charts take into account things such as mums height, weight and the weight of any previous babies and then they can customise the chart so that it can help plot babies growth more accurately, instead of using a normal standard chart. I was very shocked to learn that not all hospital trusts have these customised growth charts in place for expecting mums. I dread to think what could have happened if I had not of been treated with them during my pregnancy - as at least one third of stillbirths are related to growth restriction. This is where Mama Academy play a huge part in trying to reduce the stillbirth rate here in the UK as we shockingly have one of the worst stillbirth rates in the developed world. Mama Academy is a registered UK charity who work alongside the Royal College of Midwives. Their aim is to equip expectant mums and also health care professionals with vital knowledge so that every baby has the best chance of arriving safe and healthy and no parents has to unnecessarily go through the heartache of suffering a stillbirth. They aim to do this by. Educating expectant mums on health in pregnancy, complications and how to reduce the risks of stillbirth. Assisting health care professionals by keeping them up to date with the latest practises, guidelines and research to help provide consistent maternity care. Mama Academy's main campaign is called 'Made To Measure', which is a campaign that aims to reduce the number of stillbirths in the UK by implementing Perinatal institutes growth assessment protocol. Which are the customised growth charts that I was lucky enough to have in my pregnancy, as these charts would, as they did in my case pick up if there was a problem with baby's growth. Mama Academy have also very recently launched Wellbeing wallets which are a handy folder for expectant mums to keep there hospital files/ letters in and are full of useful information to help educate mums to be on having a healthy, positive pregnancy. You may have seen them advertised recently by Dr Ranj (from CBeebies) and they are available to buy directly from the Mama Academy shop for just £2 including P&P, which is such fantastic value. 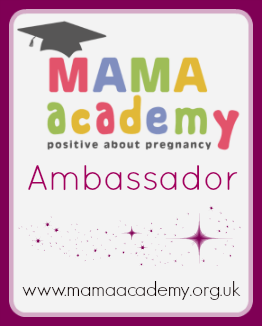 I really feel that Mama Academy do such fantastic work and I love the Mama Academy message of promoting happy, healthy, positive pregnancies. And that they educate parents-to-be and health professionals to help try and reduce the stillbirth rate here in the UK. If you are expecting a baby then please do go and check out the fantastic Mama Academy website . What a great idea. We never had a personalised growth chart when pregnant. We did get measured by our tummy size?